Submitted by the_kenose on 2018-06-19 12:43. You find yourself among a handful of friends and foes in a strange world behind a Wall higher than anything you've seen before. 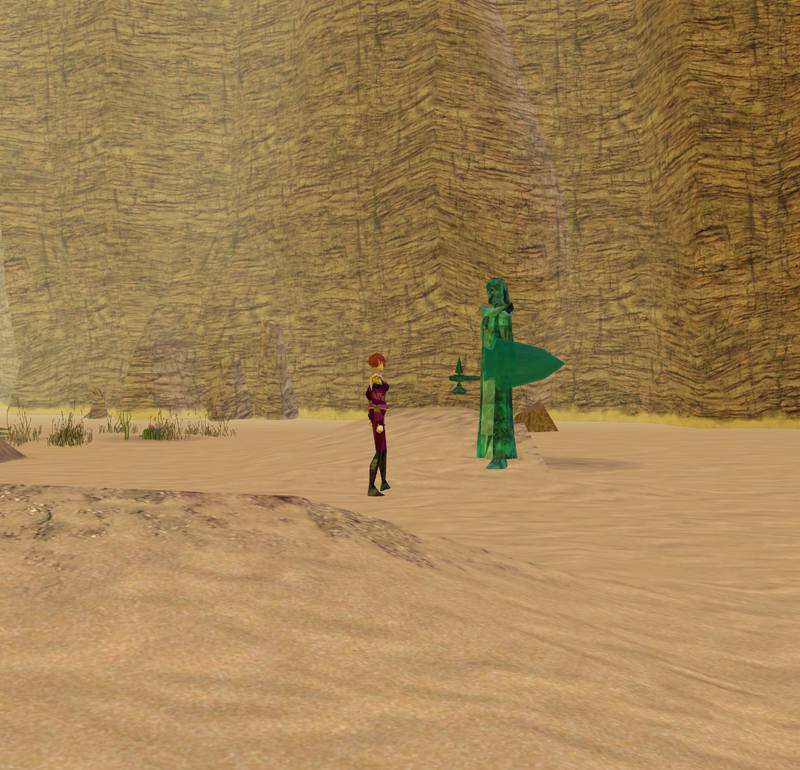 The desert all around seems unwelcoming and there is little reason in what this emerald statue may say to you... What could be the truth, and what could you do about it? You should really add more details to your description, such as starting level, setting, classes, races etc. This was super interesting, short as it was. Spooky. The furnace certainly made me very uncomfortable. x_x Are you considering writing a bigger story in this setting? I'd play that. "asked you to vsiit" -> "asked you to visit". - Found bird before going to Rijakuw again, only had option to tell Rijakuw "I need to find a bird for them". - Using a recursive pseudohb for the bird while the PC is in range could make the bird running away a great deal smoother. I tried to "herd" the bird back to Khaun for a while, trying to go for the "alive" part of the "dead or alive" specification, but that didn't work. If you've got any scripting questions on how to implement something, don't hesitate to ask! - Would suggest expanding radius of the furnace sound objects a bit more. Did not actually approach furnace closely enough to notice until after seeing the dialogue options to mention them. - Immediately went to explore abandoned settlement. Do not know what I expected to happen. - Spent quite some time running around in identical desert areas. Arguably atmospheric, but also somewhat boring. Floor triggers or timed events (even just sinister flavor messages) could make the exploration a good deal less "How long am I going to be walking around in empty areas?". - What is up with the poetry books! I am equal parts scared and confused and wanting to know more. - The bird corpse seriously had me wondering whether the PC is hallucinating the bird being a bird. I was not comfortable with that situation at all. Thank you for the comment, I will try to fix the issues mentioned and expand the module description. I was actually thinking about some of your suggestions but had no idea if they would be for the better or worse. The settlement and the poetry books are for planned additional content that I haven't finished yet, I planned to expand the module if people were interested, but couldn't find any testers so far. I think I found a bug: journal says I was "hostile" to the shadowfolk and I should bring the green statue with me. But "they" still play the same dialogue, preventing me from progressing. It would also be nice to have area transitions span whole sides of areas - would cause less tab-hunting for them. There is also no journal entry when I steal from their sarcophagus. They just go agro. The module is baseline, but somehow creepy. I like that. Perhaps starting at early dawn would add to the atmosphere? I can also test next version of the module for you, if you want. Hi, what's the suggested starting level for the mod?